The Baader Color Filter Set includes a selection of six filters. Each is a disc of colored glass ground to be plane parallel and then polished until very smooth, antireflection coated, then housed in machined aluminum cells. These filters vary by color and by density. This selection of filters include lighter and darker variations of red, green, yellow and blue. We offer them as shown on this page in 2 inch diameter (50.8 mm) thread-on housings, we also offer a 1.25 inch color filters set also with thread-on housings. Note these are sold ONLY by the set of six (6) assorted colors. 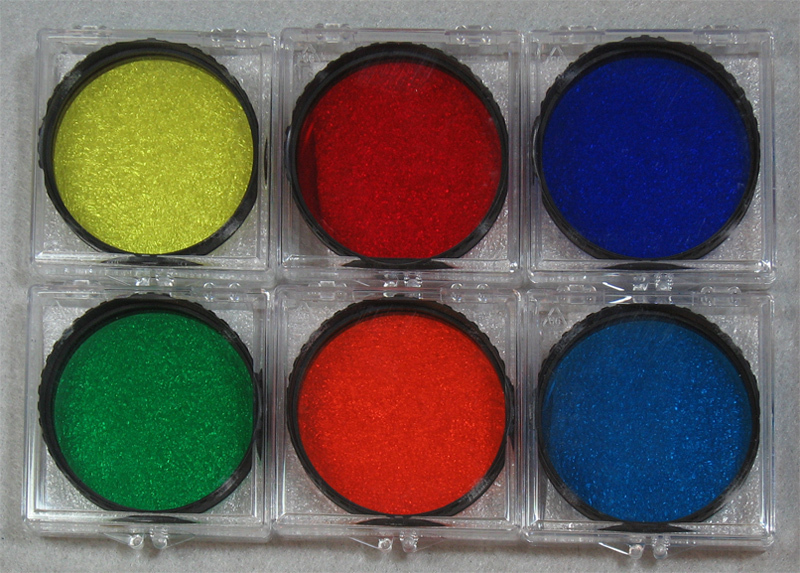 Above: Baader 2 inch diameter color filters set (70,690 bytes). 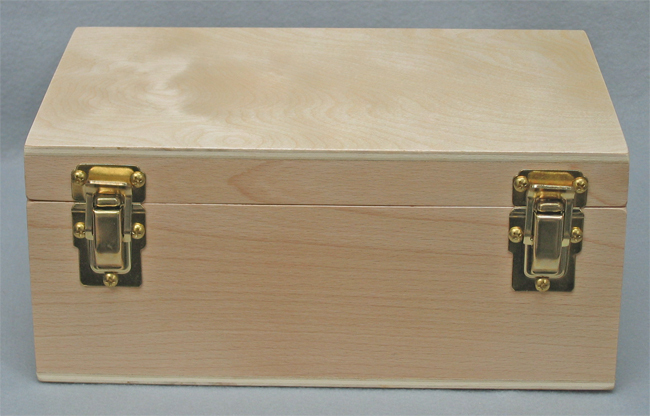 Click on image for enlarged view (291,581 bytes). telescopes with longer focal lengths on the order of >2,800 mm, where 2 inch diameter eyepieces may make sense when viewing the entire Moon, or even on planets. for use with binocular viewing attachments with two inch diameter eyepiece holders, or with 2 inch diameter nosepiece or field fittings. stacking with other color or nebular filters to narrow the band pass. for special effects or compensation when imaging with film or CCD cameras. Most amateur telescopes will do just fine with the smaller 1.25 inch diameter filters on their eyepieces. 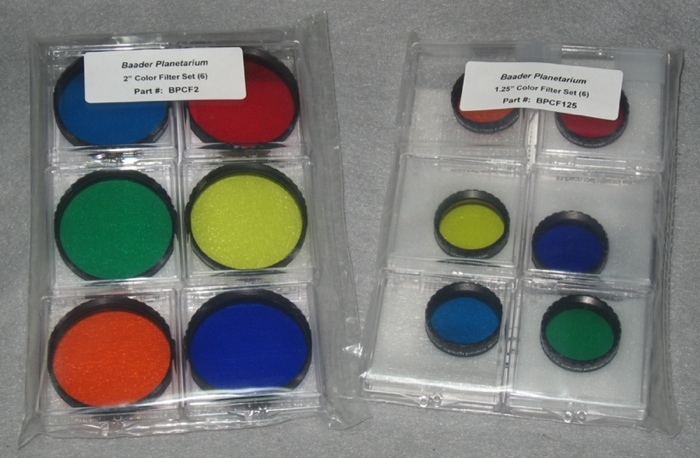 Right: Baader color filters sets of 2 inch alongside the 1.25 inch diameter set for comparison (59,853 bytes). Click on image for enlarged view (134,835 bytes). Red (610 nm) Longpass P/N 22458307. All filters will thread into conventional slip fit eyepieces or accessories with the common 2 inch diameter x 42 tpi (48 x 0.6 mm) threading; this thread pattern has been tested and optimized to fit allmost all eyepieces on the market. Stackable filters: Each filter cell incorporates both a male and a female thread to allow stacking the filters to obtain narrower passbands, or to combine the effect with a UV/IR Rejection Filter. 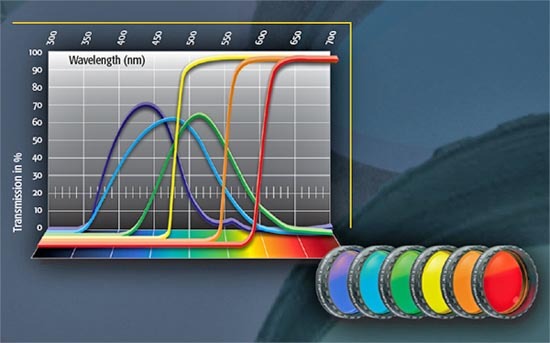 For instance, combining the Yellow filter with the Blue-Violet filter results in a very narrow dark green filter that transmits light only from 475nm to 500nm. You can also combine the color filters with other filters. We recommend using the Yellow filter with the Baader Neodymium Moon & Skyglow filter to boost the contrast on Mars. The combination of the Red 610 (# 22458307) with an our UV/IR Cut/Rejection Filter (# 2459207) for instance results in an extremely narrow H-α passband-filter at an incredibly cheap price, and with no reflections or stray light. When stacking filters on eyepieces however, be careful that the eyepiece barrel with the filters attached does not protrude in far enough to strike the mirror or prism of your diagonal. The filter cell features the largest clear aperture of any 2 inch filter on the market - for complete freedom from vignetting at any focal length. The front crown of the cell incorporates milled notches which makes handling and threading the filter an easy operation in the dark.